This information is especially directed to all journalists and media. In Argentina there is currently a serious attack on freedom of the press, of expression and the right of journalists to inform people. Click on IN VIVO on the top right to watch their TV program. 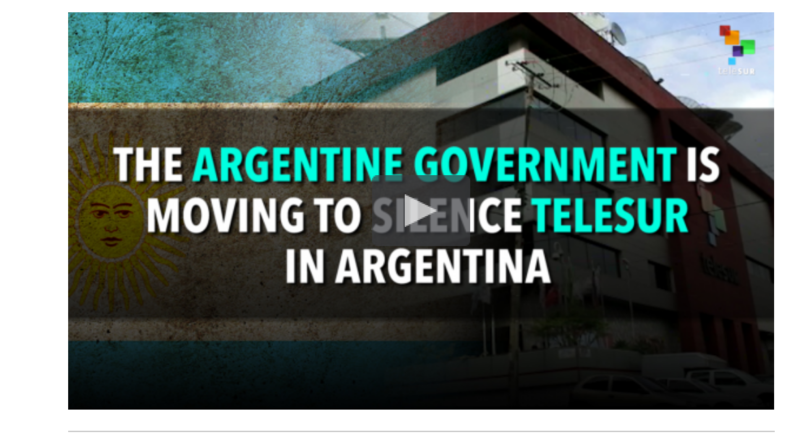 Let us allow the journalists and teleSUR speak for themselves in their statement published on 28 March 2016.
teleSUR responds to the Argentine government’s decision to withdraw its stake in the multi-state channel. This Sunday the Argentine daily La Nacion released an article by Jose Crettaz, titled “The Argentine state is leaving teleSUR,” that leaked information about the withdrawal of said country from the multimedia station. This means that teleSUR will no longer be broadcast on the Open Digital Television state platform nor will it be mandatory to include the station in private cable packages. The article publishes declarations from Communications Minister Hernan Lombardi and the Secretary of Public Communication Jorge Grecco, who have decided to abandon the multi-state channel, made up by Venezuela, Cuba, Ecuador, Bolivia, Nicaragua and Uruguay. The article in La Nacion speaks, with bias, of President Mauricio Macri defending” the “pluralism” of the media, who decided to abandon teleSUR – without any formal communication with the outlet’s leadership nor through the corresponding diplomatic channels. The aforementioned Argentine state official has only proffered declarations to the media, without establishing any contact or giving any notice to the multi-state outlet. But it is no coincidence that this conservative newspaper published on, Easter Sunday, the news that Argentina would abandon teleSUR. They are the same people who, only hours after Mauricio Macri’s victory as president, published a polemical editorial titled “No more revenge,” in which it asked for amnesty for dictatorship-era repressors, an article which earned the condemnation of Argentines on social media and even their very own journalists. The government of President Mauricio Macri has begun the process envisioned in the cooperative agreement with Venezuela to abandon their ownership stake in the chavista news channel. teleSUR is a revolutionary communication experience, a project of integration, envisioned by Hugo Chavez. It is an unprecedented source of information with more than 40 correspondents in the world, whose sole task is what has upset the big media networks of the oligarchy: telling the stories other media outlets do not. It is a channel that was born to build the independence and sovereignty of the people, in the service of the ideal of Latin American and Caribbean integration. Chavista news channel? If showing reality via the outlet and not that of the news agency business is being Chavista, then yes, we are. It must be highlighted that this channel has not received any oral or written communication about the process to abandon teleSUR. Our only meeting with the minister was televised and produced when the channel broadcast live an exclusive interview with Minister Hermann Lombardi and the Uruguayan host Víctor Hugo Morales during our special coverage of the electoral process in the southern nation. There has not been any communication between Minister Lombardi and the president of our channel, and therefore no discussion of editorial or journalistic issues. The article from La Nacion indicates that this decision was expected by the Bolivarian government, which President Mauricio Macri has be clashing with since he called for the freedom of prisoners in Venezuela. The condemnation of Mauricio Macri is not for “political prisoners” it is for the jailed politician Leopoldo Lopez, who initiated and promoted the coup plan known as “La Salida” or The Exit (an allusion to the exit of Nicolas Maduro from the presidency of Venezuela). Leopoldo Lopez was sentenced to 13 years and nine months in prison for four crimes relating to the anti-government protests of 2014, which led to the deaths of 43 Venezuelans: including public instigation to crime such as property damage and arson. Macri “stands up” for the freedom of political leaders who have committed crimes but when it comes to his own country, he does not. For example, he asked Argentina’s district attorney’s office to formally open an investigation into Hebe de Bonafini, president of the Grandmothers of Plaza de Mayo, for supposedly “initiating collective violence” – what she actually called for was “resisting and confronting” policies created by the Macri government. The same thing happened in the case of Parlasur lawmakers and social activist Milagro Sala, who Macri’s government accused of allegedly stealing money earmarked for the Tupac Amaru cooperatives, backing up claims of Jujuy Governor Gerardo Morales. But in the end there have been no clear reasons for her detention, other than this: leading a camp that rejects the politics of the state executive. At teleSUR, we are committed to building our own agenda that keeps to its values and professional ethics. We say no to personal interests that look to shift the balance of truth. At teleSUR, analysis of facts go together with our code of values and the journalistic conduct of our more than 40 correspondents and collaborators across the world. Nothing different could be expected from the owners of La Nacion, who conform to their class role, which places them on the side of big media and against the collective rights achieved in Latin America. This project belongs not only to Venezuela but also Bolivia, Uruguay, Cuba, Ecuador and Nicaragua. The journalistic content published on teleSUR has a leftist editorial line and reaches audiences in Latin America, North America, the Caribbean, Europe, the Middle East and parts of Africa, covering issues such as the refugee crisis in Europe, the disappeared in Mexico, the war in Colombia, the blockade against Cuba and the racist killings in the United States, amongst others. La Nacion labels governments that have made historic social achievements as “populist.” Specifically in the case of the Kirchners, in 10 years poverty was reduced, and around 970 suspects of crimes against humanity, committed during the civic-military dictatorship, were charged. The Kirchner decade also made other social gains, like increasing coverage for retirees from 66.1 to 94 percent. The governments dubbed “populist” by La Nacion are connected by one thing: the people are placed above the interests of the powerful elite. With the Bolivarian Revolution, Venezuela became the country with the fifth-highest university enrollment in the world, according to UNESCO. Are they defending pluralism or have they made a decision to censor us? The slogan of this integrationist project truly is “our north is the south,” teleSUR is not a government mouthpiece, it is the voice of the people, it is live news online and on air, with documentary and news-worthy content, that, despite right-wing government threats and attempts to bombard it, has not stopped broadcasting. In teleSUR, we ask ourselves – are they defending pluralism or have they made a decision to censor us? What was published expresses an open interest in making teleSUR disappear. As a company registered as a business in Argentina, any action against our correspondents would constitute an open illegality and we will denounce it as persecution. teleSUR began transmission on July 1, 2005, at a time when some left-wing governments in Latin America were already beginning to work together, as was confirmed by the Summit of the Americas in November of that year, which lay to rest the idea of integration on the basis of a continental market. La Nacion inundates its article with criticism of our channel and makes obvious its role as an accomplice of Mauricio Macri, shifting attention toward Venezuela and showing us how the channel is “managed” by the government of Nicolas Maduro, while in Argentina the new government dismantles the mechanisms that protect people’s freedom of expression, eliminates gas and electricity subsidies, devalues the currency, executes mass layoffs, names judges by decree, among other neoliberal measures. Sadly, the author the La Nacion article does not understand the substantial difference between a state, that acts as a mediator between the FARC and the Colombian government to put an end to more than half a century of war, and a political ally. Our journalists in Colombia cannot describe what it has meant to work as a journalist in the middle of an internal armed conflict with accusations like these, which at one time were made by ex-president Alvaro Uribe. Today the world recognizes that Colombia lives in conflict and that this must be resolved through dialogue. The position of teleSUR on conflicts will always be: on the side of the victims. “This statement is in line with what we have proposed for public media in terms of pluralism and austerity,” argued the minister of communication and public content, Hernan Lombardi. Indeed Macri’s party Cambiamos seeks to achieve pluralism by eliminating channels, like teleSUR, which is broadcast freely via satellite to America, Europe, Asia and parts of Africa. “teleSUR must be doing something amazing because so many oligarchs want to silence it,” said Mexican philosopher Fernando Buen Abad. teleSUR has shown the demonstrations of thousands of Argentines against Macri’s government, which in its first 100 days in power has broken the record of government layoffs, leaving thousands of Argentines jobless. In fact, next April gas services will suffer an increase and they are considering the possibility of increasing the cost of water and electricity services. Analysts calculate a rise of 120 percent that would increase costs to consumers. Is Macri’s intention to silence critics of his government? Is it about pluralism or censorship? The television program “Economic Policy,” hosted by Roberto Navarro and broadcast by the channel C5N in Argentina, was not transmitted on March 20 after they promoted a three-hour special analysis called “The business partner of the president,” which sought to expose the links between Mauricio Macri and the businessman and personal friend Nicolas Caputo. On March 18, the channel C5N was attacked after the Integrated System of Argentine Social Security (AFIP) was informed by an article in the daily La Nacion of the channel’s supposed fraudulent insolvency. On Dec. 25, 2015, President Macri ordered the channel Senado TV to be immediately suspended until further notice. Similarly, on Nov. 24, 2015, the Argentine president announced that he would take off the air the program “6,7, 8”, a Kirchner communication program providing social and political critique, broadcast by Public TV. On March 4, teleSUR was taken off the basic package offered by Cablevision in Argentina, without legal basis, depriving millions of Argentines from enjoying 24-hour nonstop news. teleSUR is available from more than 90 cable providers and maintains agreements with more than five open television stations in different provinces of the country, reaching, until Feb. 9, more than 20 million potential viewers and 8 million subscribers. teleSUR reiterates that its love for the Argentine people is unconditional as is our commitment to doing the best we can every day to share the stories of our region in the best way possible. Our team in Argentina will continue working and we demand on their behalf that they be given the conditions for free journalistic expression. teleSUR reiterates to the officials of Macri’s government our willingness to debate the reasons and arguments, as well as the truth, so that we can protect our relationship. They are not going to make the truth disappear, they are not going to make teleSUR disappear.